Updated May 5 at 12:53 p.m. PDT with information about funding for a second Mobile Launcher. There are “emerging concerns about the structural integrity of the Mobile Launcher’s base” from which NASA’s Space Launch System (SLS) and Orion spacecraft will lift off, according to a new government assessment. The Government Accountability Office (GAO) found that “loads models have indicated low stress margins in critical locations in the Mobile Launcher base. The program attributed this issue to an error in their model. A source familiar with the project said the flawed model was done by steel contractor RS&H. The company analyzed the modifications required when NASA switched from the Constellation launcher to SLS. “The margins were negative in some cases, and modifications will be significant, but are going well and there should be no schedule impact,” according to a source, who requested anonymity because he was not authorized to speak to the media. In March, President Donald Trump signed a spending bill that provides $350 million to NASA for fiscal year 2018 for the construction of a second Mobile Launcher. The information about the Mobile Launcher’s structural integrity problems was included in GAO’s new report, “NASA: Assessments of Major Projects.” The assessments found that nine of 17 projects surveyed have experienced cost or schedule growth. The Mobile Launcher is part of NASA’s Exploration Ground Systems (EGS) program, which has experienced cost increases and schedule delays. The total cost overrun depends upon the launch date for the Exploration Mission-1 (EM-1), which will test SLS and an automated version of the Orion spacecraft. “The new launch readiness date for EM-1 is now December 2019, but NASA has allocated 6 months of schedule reserve to June 2020 for possible manufacturing and production schedule risks. This represents a delay of 13-19 months for EM-1,” the report stated. “The life-cycle cost estimate for EGS is approximately $3.1 billion to the December 2019 date and $3.2 billion to June 2020, or 11.8 to 14.9 percent above the project’s committed baseline,” the assessment added. The GAO assessment said EGS’s two major software development efforts—Spaceport Command and Control System (SCCS) and Ground Flight Application Software (GFAS)—are the program’s main schedule drivers. “GFAS continues to face challenges due to late deliveries from the SLS and Orion programs and delays in SCCS; however, program officials stated they have been heavily focused on resolving SCCS challenges,” the assessment found. The GAO also found that verification and validation activities have begun for the Mobile Launcher even though ground support equipment and umbilical installation projects are still underway. The GAO’s assessment of EGS is reproduced below. The Exploration Ground Systems (EGS) program is modernizing and upgrading infrastructure at the Kennedy Space Center and developing software needed to integrate, process, and launch the Space Launch System (SLS) and Orion Multi-Purpose Crew Vehicle (Orion). The EGS program consists of several major construction and facilities projects including the Mobile Launcher, Crawler Transporter, Vehicle Assembly Building, and launch pad, all of which need to be complete before the first uncrewed exploration mission using the SLS and Orion vehicles. In December 2017, NASA announced a new schedule and cost estimate for the EGS program, after determining that the November 2018 launch readiness date for Exploration Mission-1 (EM-1) was no longer feasible. NASA is now planning to a launch readiness date of December 2019, with 6 months of schedule reserve to a June 2020 date. The life-cycle cost estimate for EGS is approximately $3.1 billion to the December 2019 date and $3.2 billion to June 2020. The program’s schedule is currently driven by its two major software development efforts, both of which are undergoing technical challenges. For example, the ground control system is in the process of transitioning to a new contractor and is undergoing organizational changes. In addition, while the program has made progress with major projects such as the Vehicle Assembly Building and Launch Pad 39B, the Mobile Launcher is continuing to have technical challenges. Fifteen percent of the Mobile Launcher’s accessories and umbilicals still have to complete testing, and there are emerging concerns about the structural integrity of the Mobile Launcher’s base. In December 2017, NASA announced a new schedule and cost estimate for the EGS program, after determining that the November 2018 launch readiness date for Exploration Mission-1 (EM-1) was no longer feasible. In April 2017, we found that the date was likely unachievable for all three human spaceflight programs — EGS, the Space Launch System, and the Orion Multi-Purpose Crew Vehicle — due to technical challenges continuing to cause schedule delays and the programs having little to no schedule reserve to the EM-1 date, meaning they would have to complete all remaining work with little margin for error for unexpected challenges that could arise. The new launch readiness date for EM-1 is now December 2019, but NASA has allocated 6 months of schedule reserve to June 2020 for possible manufacturing and production schedule risks. This represents a delay of 13-19 months for EM-1. The life-cycle cost estimate for EGS is approximately $3.1 billion to the December 2019 date and $3.2 billion to June 2020, or 11.8 to 14.9 percent above the project’s committed baseline. EGS’s two major software development efforts—Spaceport Command and Control System (SCCS), which will operate and monitor ground equipment, and Ground Flight Application Software (GFAS), which will interface with flight systems and ground crews—are the program’s primary schedule drivers, and the program has recently restructured the organization of the SCCS in order to address gaps in systems engineering processes, among other concerns. EGS’s other major software development effort, GFAS, continues to face challenges due to late deliveries from the SLS and Orion programs and delays in SCCS; however, program officials stated they have been heavily focused on resolving SCCS challenges. According to program officials, increased processing needs combined with unplanned rework led to higher complexity in the SCCS system. This complexity in turn led to a program review of SCCS, which found gaps in the system development process and in SCCS’s organizational structures. As a result of these issues, EGS is restructuring the Systems Engineering and Integration organization, augmenting hardware, and hiring more staff. Program officials noted that a challenge in this restructuring is hiring because NASA is competing for software developers with the local aerospace economy. The program is also executing a pre-planned transition that moves SCCS under the same contractor as GFAS and will shift the SCCS development structure to smaller deliverables that can be released more often. A senior NASA official said that EGS’s software development is a top issue leading up to EM-1, and that as a result, the EGS Associate Program Manager was temporarily reassigned to exclusively manage enhancements to the EGS software development effort. The EGS program has made progress on several projects, including the Vehicle Assembly Building and Launch Pad 39B, but technical challenges continue with the Mobile Launcher. The Mobile Launcher supports the assembly, testing, and servicing of the SLS rocket and provides the platform on which SLS and Orion will launch. The program has started verification and validation activities for the Mobile Launcher, while ground support equipment and umbilical installation projects are still underway. For example, 15 percent of the Mobile Launcher’s umbilicals and launch accessories still have to complete testing. Program officials previously said this concurrency increases risk because of uncertainties regarding how systems not yet installed may affect the systems already installed. In November 2017, EGS reported that loads models have indicated low stress margins in critical locations in the Mobile Launcher base. The program attributed this issue to an error in their model. The program is currently designing structural reinforcements for the base of the Mobile Launcher and hydraulics pedestals for the launch pad. Program officials stated this approach could be completed within the program’s existing schedule. technical comments, which were incorporated as appropriate. gosh will congress let NASA risk it? Better build two more new ones…. I would love to see bfr first stage launch before SLS. Yeah, not likely, but still. Every day that passes makes this look more and more like a horse race. the best we can hope for is a few bfs tests, but even that will be a significant blow to sls credibility. If RS&H made the error, shouldn’t NASA be suing them to recover the costs? In the industries I worked in they sure as hell would! If the BFS hops off a pad in 2019. The SLS will be in deep trouble along with the current NASA cislunar & Mars plans. The BFS is a better version of the costly and long build out Lunar Orbital Platform Gateway that could also land a few dozen tonnes on the Moon and fly back to Earth without refueling. IIRC the BFS could do SSTO to LEO with very minimal payload and return to Earth. Maybe it might do a few sightseeing zero-gee sub-orbital flights for thrill seekers as shakeout cruises. We will see how much progress with the construction of the BFS next year. Check on Musk’s twitterfeed regularly for updates. Trick is to get the client to sign off on exactly what they want done, rather than a general goal. Then perform exactly the letter-of-the-contract work required, then “notice” that no-one has authorised a certain key structural analysis, then get paid to do the analysis, and reveal that major structural changes need to be done, then get paid even more for doing those changes because the client is “modifying” the terms of the contract and so has to pay penalty rates. The fact that everyone knows you should have picked up the issue before you did the initial work somehow never counts against you. If anything, in future bids you will be scored higher because of your “experience” at working with NASA to fix “unforeseen” problems. Which is why in contracts I wrote wherever possible I used out turn specifications. If they didn’t achieve, they didn’t get paid. According to NASA Watch the date for the first SLS launch has already slipped beyond the date in this report. As for the first launch with a crew on it…. It was an old mobile launcher with wear and tear on it that has been exposed to a lot of salt air by the ocean. That apparently added to the problems. Then poor modeling led to insufficient reinforcements. And now they have to do more work on it. It probably would have been better to have built a brand new one from scratch rather than to bulk this one up. And that’s what they’re actually going to do now. Another cost in an extremely costly program. I’d be surprised to see this Mobile launcher go more than one launch. If I recall that is all it has to do since the second SLS Launch will use a different upper stage that would make it too heavy. That is why Congress is giving NASA hundreds of millions to build a new mobile launcher. Except now NASA is apparently looking seriously at the possibility of ordering another ICPS stage from ULA and doing at least a second Block 1 launch. The number of ways SLS is screwed up and the number of uncle-tom-cobbly proposed NASA “solutions” continue to metastasize like melanoma. My browser was being wonky yesterday and didn’t load your Twitter image. I see I missed something important. If this is true, then things with SLS and Orion are far worse than posited in my prior comment below. Given that it would take the Second Coming to see the Exploration Upper Stage ready by 2021, at least the first five missions, including the first manned one, must now be planned for the roughly Falcon Heavy-class SLS Block 1 with the wimpy ICPS upper stage. Good news for ULA which makes the ICPS, but only – of course – if the whole program isn’t cancelled. The only way EM-5 could fly on Block 1B, with EUS, is if either those first four unmanned missions include at least one Block 1B – and are, thus, not all identical – or NASA waives its rule against flying people on an untested upper stage. Waiting that long to fly people on SLS would also put that crew on the first launch of the SLS core stage with new-manufacture RS-25E engines as there are only enough Shuttle-surplus RS-25’s to cover four missions. Is NASA nuts enough to put people on the first flight of new 1st stage engines and a new upper stage? And why is this schedule slippage happening in the first place? Perhaps the RS-25E “reboot” is also slipping in rough synch with the EUS. A third possible horse in this slow race is the Orion Environmental Control and Life Support System. The Orion ECLSS system is not supposed to fly in final form on the initial unmanned EM-1 mission. Maybe it’s been delayed enough that it won’t fly until the fourth putative unmanned mission. If BFS flies next year and SpaceX says BFR will fly in 2020 or 2021, I think any officially NASA-acknowledged slippage to a NET 2021 EM-1 mission date for SLS Block 1 by then will be the equivalent of a death sentence for the whole program. Well before that I should think. There is only 4 sets of RS-25 available along with 4 sets of steel casings for the SRBs. There is no contract in place to produce new RS-25E. Only to set up a new engine production line. With the pending retirement of the Delta IV Heavy in 2023. The DCSS or ICPS will jump in price if ULA decides to continued production. It seems unlikely with ULA transitioning to the Centaur V/ACES with the Vulcan. If there is new ICPS than new contract must be in place before ULA closes out the production line for the DCSS/ICPS. There is also the question if Boeing can developed and build the EUS on schedule with not much inhouse resources. Which was mostly transfer to ULA. The SRB need to be replaced with new SRB with composite casing since the steel casings are no longer available with the dismantlement of the only foundry capable of doing the job. A generally good laundry list of additional weevils in the woodwork anent SLS and Orion. Just one quibble – I believe AJR’s contract to redesign and stand up a production line for the RS-25E also includes money to produce an initial production run of six engines. But these will not be available before the mid-2020’s. It looks increasingly as though the RS-25E’s will have company in that regard. You are correct that there is no current contract in place for more ICPSes from ULA. There is also no contract of any kind for additional SRB cases, be they steel, filament-wound composite, Vibranium or hypercrystallized beeswax. It would be better if they abandoned the crawler concept altogether since no one needs that many degrees of freedom when hauling a rocket from between exactly two points. Going to be fun to watch NASA explain the entire cost of SLS program in order to just lift Europa Clipper. The current AJR contract is for non-flight capable RS-25E for ground testing AIUI. Sadly, not possible. Blame it on the ponderous SRBs. 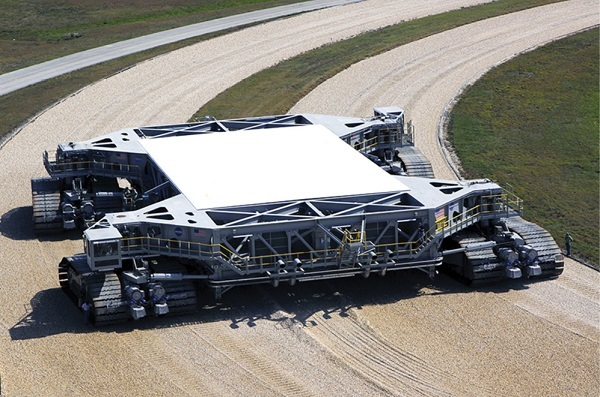 You need the crawler as long as the Congressional critter insists on using large segmented solid motors. While I agree the SRBs are dumb, they don’t require a crawler, just vertical integration. They could have built up a platform on a sets of rail bogies and just pushed with a few locomotives. You are going to need more than a few locomotives to move about 1500 tonnes of the SLS Block 1 stack minus the liquid propellants plus the mass of the mobile launch platform. Along with many sets of rail bogies and many reinforced parallel rail lines needed to support the mass of the stacked launcher and launch platform. Of course you could just stacked the rocket at the pad like they do at the Vanderberg SLC-6 site along with a few mobile service structures the size of a mini VAB. Stop it. They used this scheme for Titan IV without a problem, they could scale it up from there. At least tell me the NASA wonk in charge of managing this disaster has been fired. One locomotive is plenty. Just need the rolling gear from a dozen or so flat cars. It is not an orange to orange comparison. The entire Titan IV launch stack fueled is only about 940 tonnes. Moving something as heavy as a SLS launcher stacked on a launch platform will definitely requiring scaling up. Now this isn’t the rocket’s fault guys. Or the tornado. Just a run of bad luck. One day, folks at MSFC will be as valued as JPL. I want to live to hear people say–You know, that SLS is a pretty good vehicle after all–I was wrong to dog it so on the interwebs.